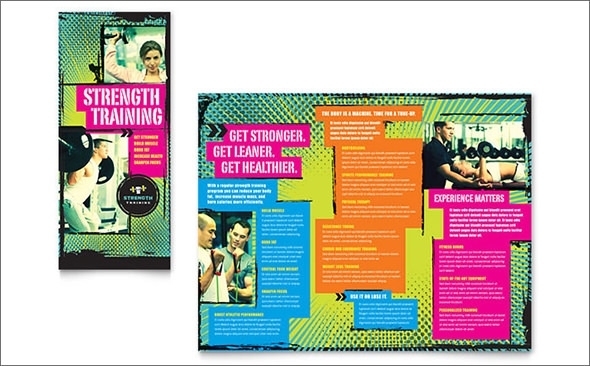 Are you someone who owns a gym and wishes to promote it in the neighborhood or the city? Well you must start working on a gym brochure right away! 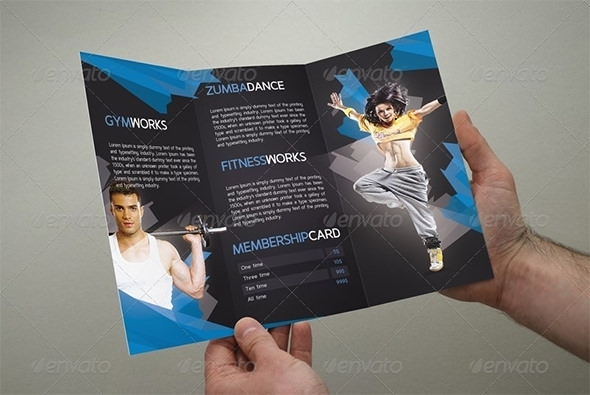 A gym brochure is the best and most effective marketing and promotion method which helps in giving the customers information about the gym and describe the various amenities and facilities that it provides.A free gym brochure template is something like Workout Log that you would need to get a start. 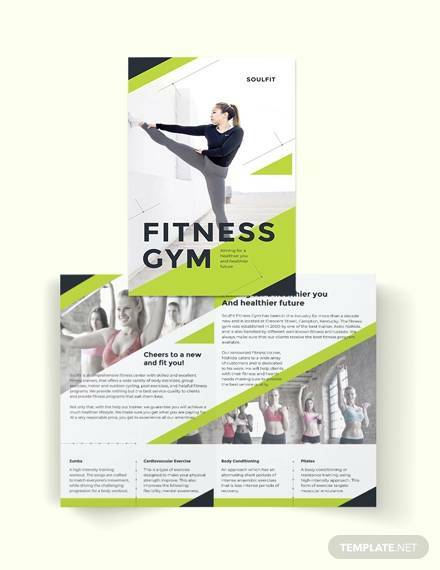 These brochure template google docs are ready to use brochure template word which can be used by gym owners to add the various premium details of the gym to it. 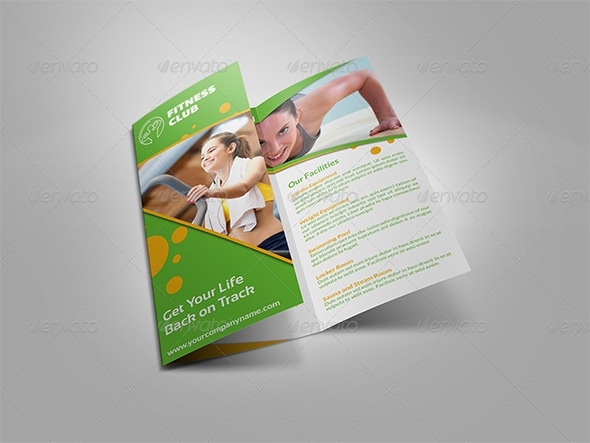 Clean A5 brochures are multipurpose brochures which can be used to create unlimited page documents with multiple variations. 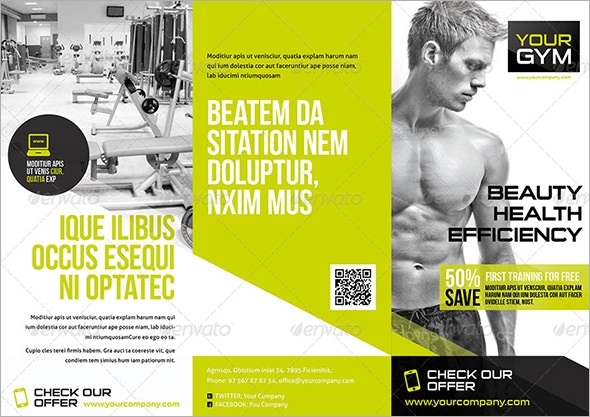 These brochures are extremely customizable and can be used by anyone for their own purpose. 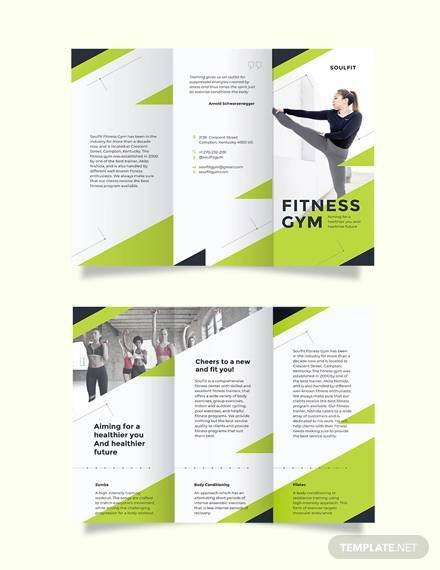 This is a wonderful brochure template with a 3D image of a character lifting weights and can be used by gym owners to frame or design their own gym brochures. 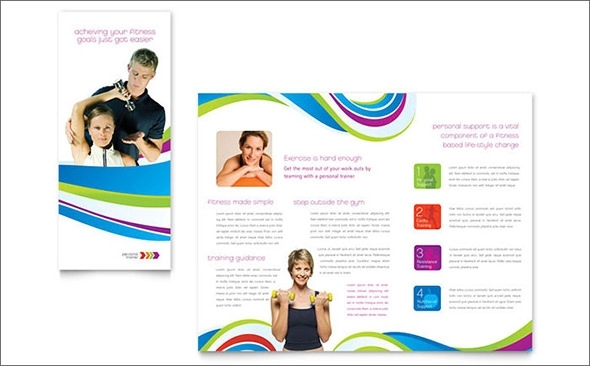 The brochure supports several formats for easy use. 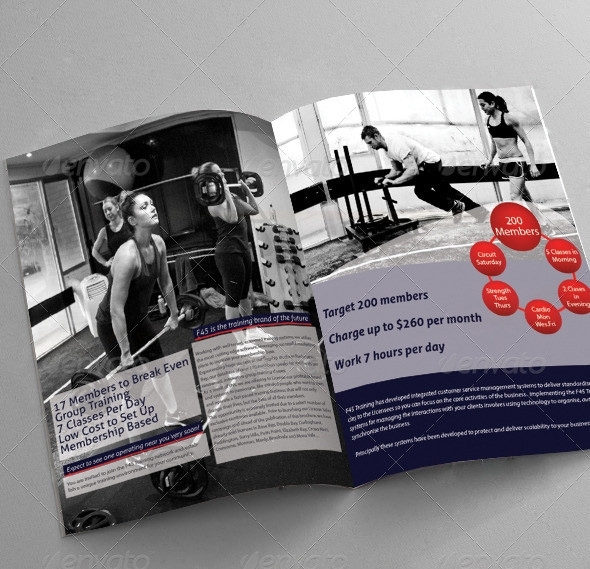 This brochure is for those who need a detailed 8 page description of their gym and supports high quality images, logos and designs on it. All the pages can have images and text both. 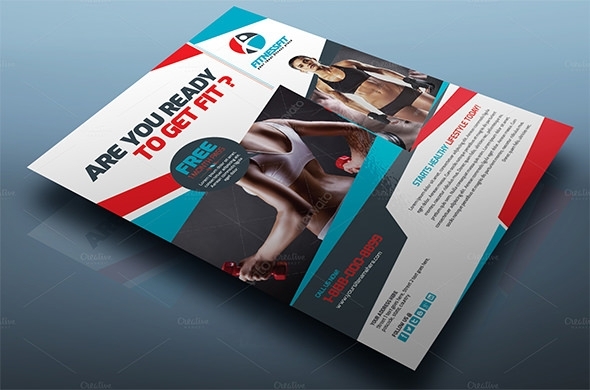 This is another type of a gym brochure template which can be used by any gym owner to get an attractive looking brochure together with colorful images. This template supports several different formats. 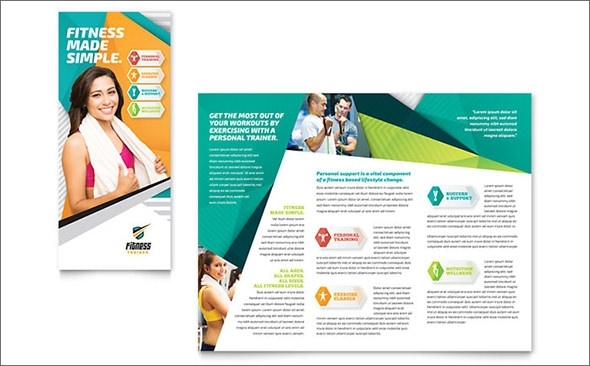 This is a print ready brochure which can be customized using images, content and logos. It works with Adobe Photoshop versions CS3, CS5, CS4, CS5.5 and CS6 and has PSD files included. 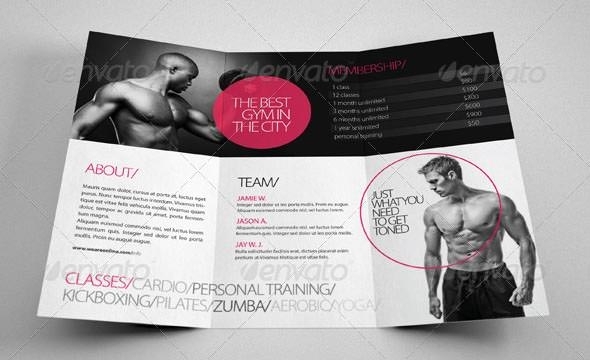 These kinds of templates must be able to describe the layout and the structure of the brochure so that the users can customize the document and use it for their own purpose. These templates are very helpful as they can easily be personalized and are also easily available. 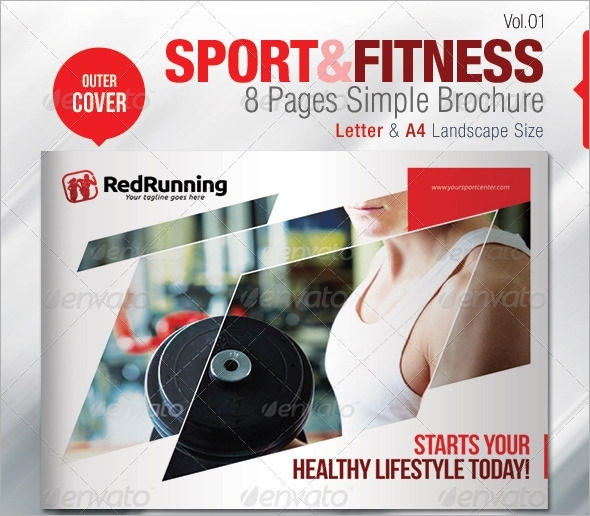 There are many readymade design templates available which are extremely customizable and offer facilities like full color graphic designs and agency quality professional marketing materials. These can be downloaded easily in many different formats. 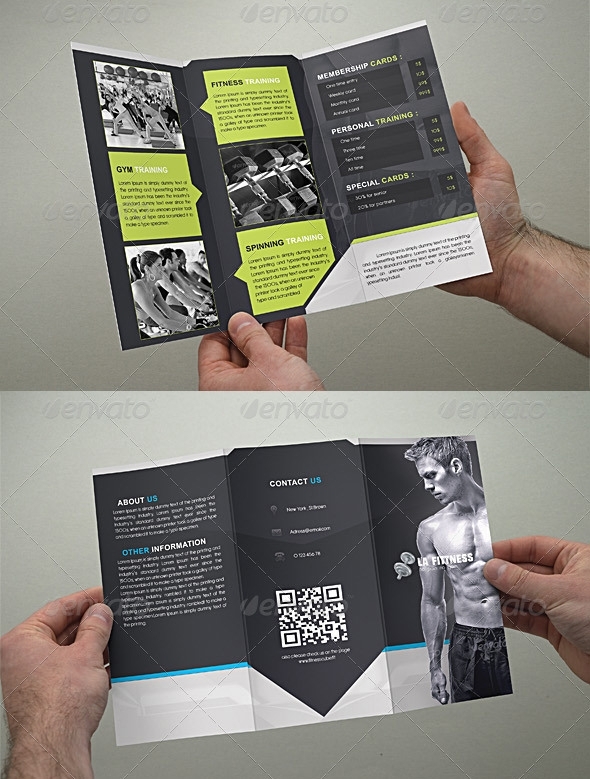 Another type of a gym brochure template is called a gym trifold. 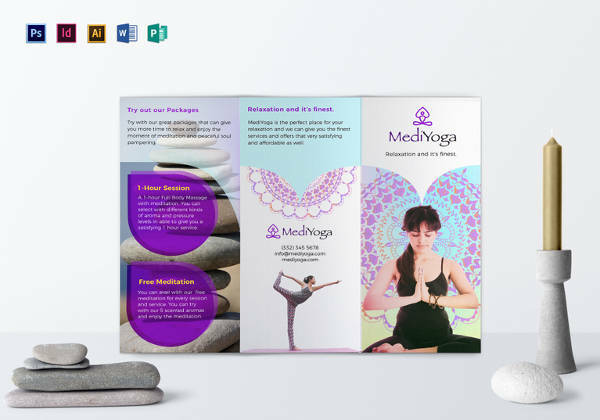 These folders have three leaflets in 6 different color versions which are ready for print and have PDF instructions included in them for easy personalization. 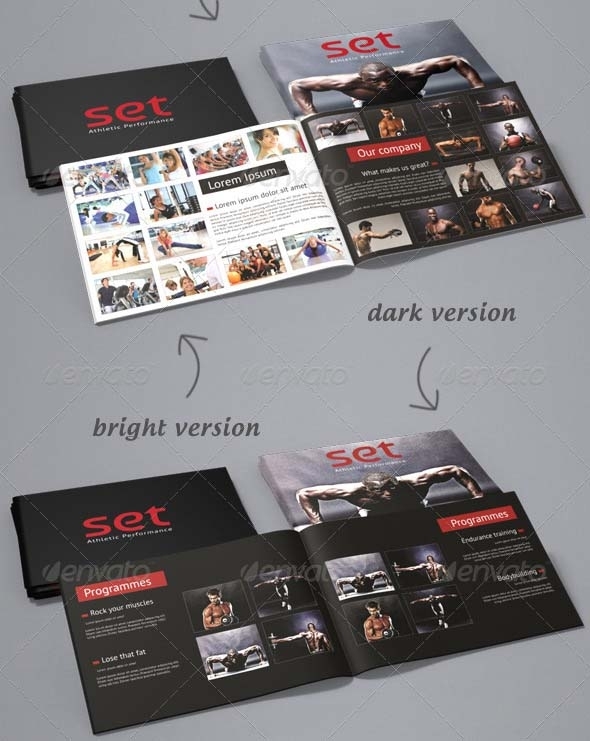 Strength training tri fold brochure template can be used by any gym owner to make his/her own gym brochure on a tri fold sheet. These include high quality photos, log designs and original artwork option. This brochure comes in the size of 8.5 inch x 11 inch. 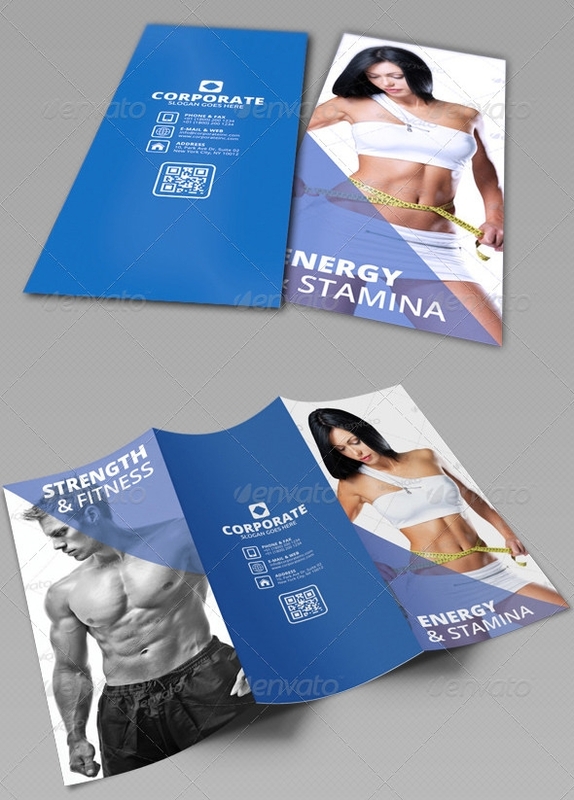 It is a ready to use and easy to customize brochure which contains an image of a girl measuring her waist size on top of it. 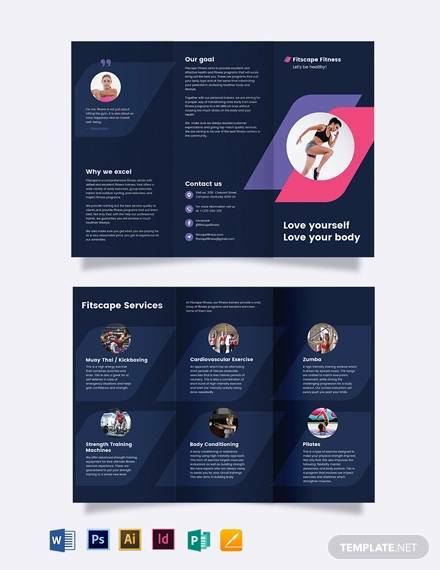 This is a kind of a brochure template which has a clean and elegant tri fold design and all its text layers are full and editable. In a help file, you can find font and picture information as well. 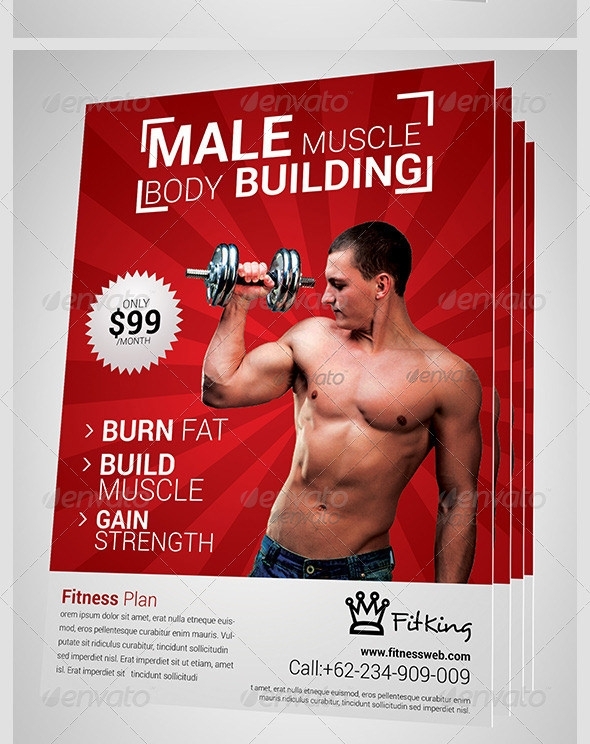 This kind of a brochure can be executed and personalized very precisely, thanks to the PDF instructions that come along with it. 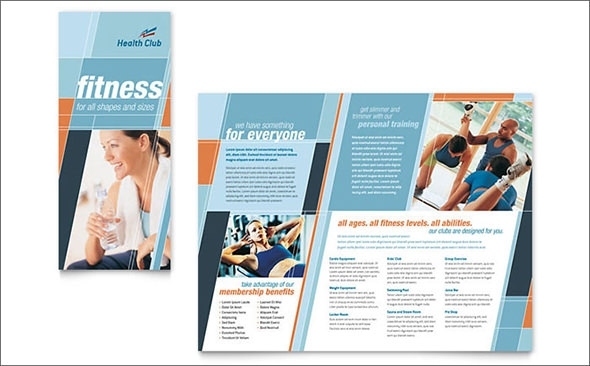 They have easy to use page layouts and graphic files as well. 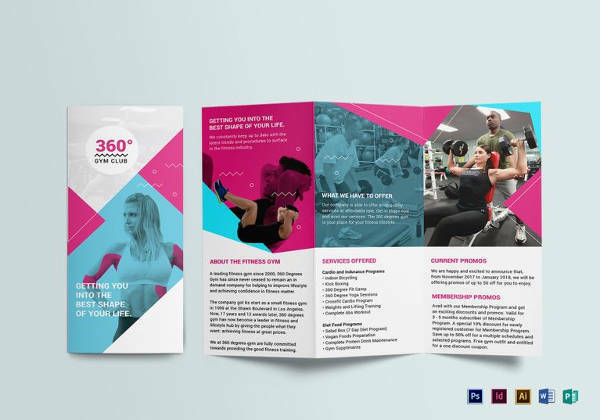 In this tri fold brochure template, there is a 3 color style included which has an easy to change color style and 2 PSD files are also provided with it. 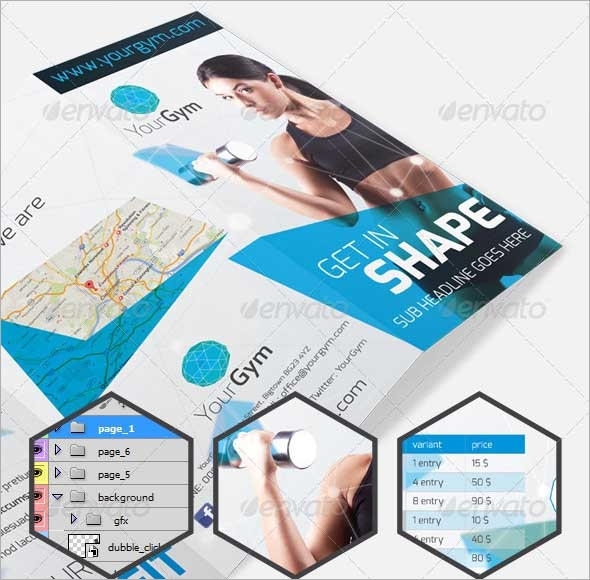 This brochure supports many different formats like Adobe Illustrator, Microsoft Word, Adobe InDesign, Adobe PageMaker and Adobe Photoshop among others. It has attractive graphics and high quality images as well.